Learning to wrap XLR cables, or cables in general, is something you should do. It’s not really THAT hard. Makemusic today released Finale 26. It adds a number of new features. You can find a run down of the new things at ScoringNotes.com. As a long…..long time Finale user (I think I used it with version 2.5 back in the 90s), Finale is a solid notation program. While there are some great free ones, like musescore, that have gotten popular, Finale is really for people who care what their music looks like. And the ability to make your music look good is important. No one wants to waste time trying to figure out bad notation. I’m probably going to update to Finale 26 soon. I’ve had a few pedalboard layouts now. The big issue I have had with the other setups is size, and transporting it. I started off with a Q-Tron on the board. But that got dropped off due to it feeding back a lot. Plus I could never tell if it was engaged or not. The main input is the Eventide MixingLink. It sounds great, and lets me bypass my effects chain if necessary. It has a couple of different settings, I usually keep it in the latch mode and FX Only. You can set it to be like a mini-mixer if you choose one of the other modes, but I don’t do that. The first item on the effects chain is the Nano POG. Now, this pedal is probably not going to survive much longer on the board. Why? Cause the next pedal, the Eventide H9 pretty much does everything it does, plus I can control it via bluetooth. I suppose I have left it on the board cause I could engage the Nano POG, and then run it through the H9 to get like 3 octaves of Q-Tron like sounds. Or Distortion. But in reality that has yet to happen. Ideally, I think I am going to sell it to get like a dedicated reverb unit. The orange pedal is a Valeton EP-2 Volume Expression pedal that I’m using as an expression pedal for the H9. 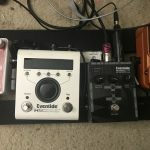 The pedalboard is a Pedaltrain PT-M16-TC Metro 16. Basically, I wanted something small, portable, but also protects the pedals. 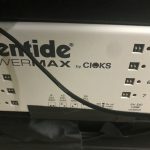 The whole thing is powered by the new Eventide PowerMax. Generally, this setup is pretty solid. Originally, I wanted to run an EWI 4000s through the board, but inconsistent volume issues killed that. I haven’t had time to revisit it yet. Things to add. I’m considering hacking up my Donner Bluetooth Page turner to put on the board. Or perhaps making a switcher using and Arduino or RPI Zero W.
Anyone else use pedals on their sax?